Shingle roofs need to be replaced over time. Shingle Roofs are one of the most popular choices for roofs today. They are durable, easy to repair, and very cost effective. However, a lot of people do not know that shingle roofs need to be replaced over time. Most roofs last between 20 and 25 years, depending on what type of shingles were used. The weather can also damage roofs over time. High winds can blow shingles off, high temperatures can cause shingles to blister and buckle, and water can also wear down the shingles. 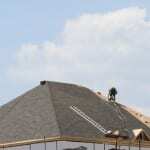 You might be thinking that you need to have your shingle roof replaced or repaired. At Slippery Slope Roofing, we can help you determine if your roof needs to be replaced or repaired. We can come and do an inspection and give you an estimate. If you are building a new home, a garage, a shed, or any other building that needs a roof, we can also take care of that. We specialize in replacing, repairing, and installing shingle roofs of all styles and sizes. No job is too big or too small. If you notice any spots on your roof that is completely missing shingles, you should probably have it repaired before there is further damage to your roof. Shingles protect the roof from the weather and create a barrier to prevent water from leaking into your house. Missing shingles can cause water damage and mold problems. If the problem doesn’t get taken care of, your roof could start leaking or even sagging in places that are damaged. Call us today at Slippery Slope Roofing for any work you need done on shingle roofs in the Midhurst, Ontario area. We will work quickly and efficiently to get your roof looking good. Whether you need shingles replaced, your entire roof reshingled, or even a brand new roof, we can take care of everything.